The 3 Drawer Cart offers a practical and versatile storage solution for any room of the home. Organize and store a variety of household items that are frequently used in the bedroom, kitchen / pantry, bathroom, craft room, nursery or dorm room. The clear drawers allow contents to be easily identified while keeping them contained. 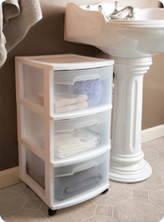 Keep clothing, towels, craft supplies, toys and more organized and neatly stored. The drawer stop feature prevents drawers from being removed accidentally. Use the included casters to create a rolling storage option, and easily move the Drawer Cart wherever it is needed. 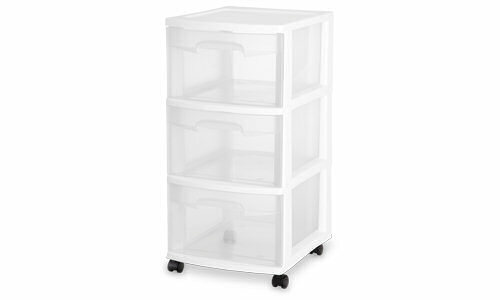 The overall dimensions of this item are 14 1/2" L x 12 5/8" W x 24" H.
Overall Assembled Size: 14 1/2" x 12 5/8" x 24"
The 3 Drawer Cart can double as a nightstand while keeping your room neat! 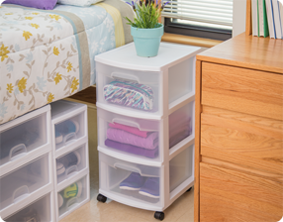 Need extra storage space in your dorm room? The 3 Drawer Cart is a great solution for sweatshirts, towels or even shoes! 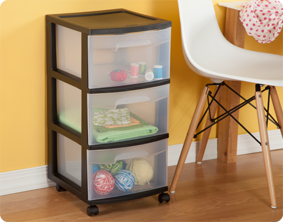 Do you need a simple way to store your craft or hobby supplies? Try the 3 Drawer Cart – the casters make it portable so you can easily move it to your workspace! Drawer Carts can be used in a bathroom to quickly organize items such as towels, bath supplies and more, keeping items easily accessible. 3 Drawer Cart is rated 4.6 out of 5 by 105. Rated 5 out of 5 by ProoferChristine from All over my house!! I have these storage drawers all over my house! !They are great for craft supplies, extra clothes, and gift wrap supplies! We have some in the garage (who knows what's in those! ), and even one in the pantry for extra bags and pet food. Love them, love them! All shapes and sizes are perfect for so many things!! 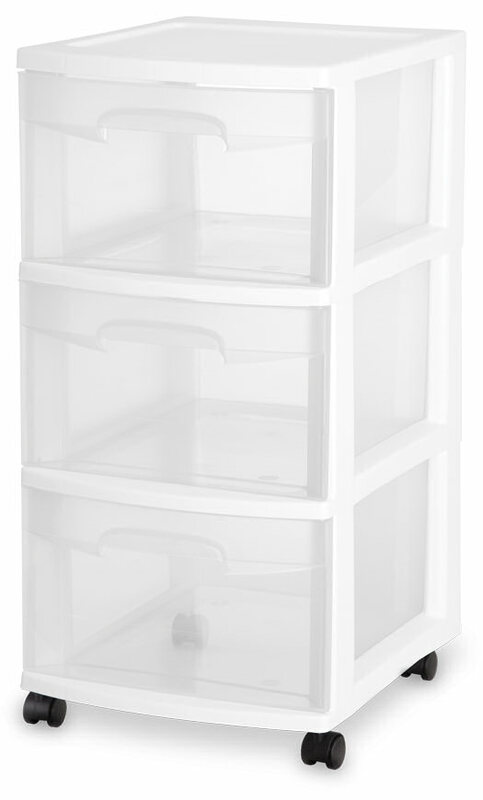 Rated 5 out of 5 by Nana580 from 3 Drawer Tower item#2830 is a great product. This product is the perfect size 3 drawer tower. I highly recommend it for storqge. Rated 5 out of 5 by Jaimeb1 from Love it The 3 drawer cart works perfectly in my son's room. It is the perfect size. It takes up little space in his room, and it stores his artwork, supplies, coloring books, and small toys. We love that you can see through the drawers as well, so that we know which drawer holds which item we are looking for. Rated 4 out of 5 by Elmo805 from Great for make-up This is a good size cart for portable storage of makeup, brushes, applicators etc. Have been using this for years..it just works and is easy to clean. Rated 5 out of 5 by DonnaLee from Great for my Work-at-Home job! I bought a couple of these a while back for extra storage but have since started a work at home job. This is great for my headphones and work files needed for the job. Then I can put it back in the closet on my days off! And the 2nd one is still storing slippers, bulk pantyhose and small purses in my closet. I have the black ones and am so grateful for their multiple useage! Thank you for all your great products! Rated 5 out of 5 by Golden from Great for small office I love Sterilite's 3-drawer cart that I use under my desk at work. My office is small but I am organized. This 3-drawer cart fits easily under my desk and within my reach. It easily hides my snacks and keeps them safe and allows me to keep paper and files organized and off my desk. Rated 5 out of 5 by jav123 from Just What I Needed This storage item was sure handy to have in my bedroom. It is a bit light weight but it is perfect to keep small items in. I like that I can see inside and know what is there, such as small accessories and other items I do not want to keep out. It is very simple and blends in very well. It has a small profile but surely met my needs. Rated 4 out of 5 by ragamuffin212 from Durable craft storage box I have several as craft storage units. I like the clear drawers to see what is stored in each drawer and also that is on wheels. The wheels make it great to store in the closet and roll out to my work table as needed. Drawers are sturdy but I would not store heavy items in them.